Circular works of art extant since Greek antiquity, tondos were revived during Italian Renaissance as allegorical depictions of powerful figures. Beyond ornamental purposes, their symbolic placement on ceilings frequently suggested defiance of the tondi’s mighty protagonists. 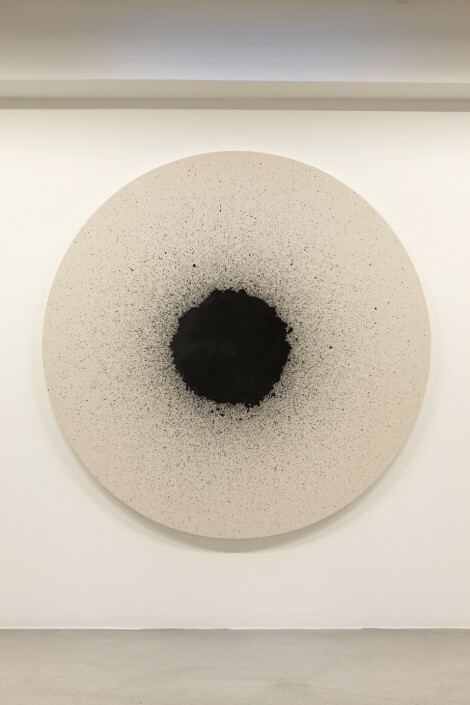 In keeping with the historically nonconformist dimension of such paintings, Moroccan artist Latifa Echakhch turns to spherical canvases which, once laid flat on the floor and set into a rotating motion, are gradually sprinkled with drops of dark ink. The resulting central sphere, with its circumferential cluster of black specks, bears resemblance to a circulating black hole that engulfs its surrounding elements into nothingness, as if it had memorised the revolving movements that caused its creation. 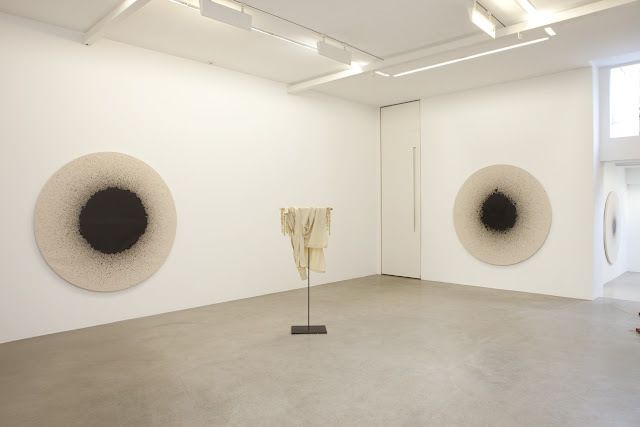 By inverting an item that historically has served as a ceiling adornment, Echakhch propels her hypnotising Tambours into the present, where she hints at the progressive extinction of free expression and the subsequent death of individual thinking. 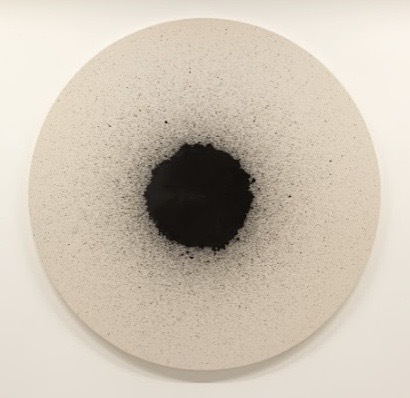 Although impersonating bad omens, Echakhch’s canvases manage to exude a serenity through the perfect roundness of an outer shape that mitigates the hazard of loosing control within a perfectly outlined environment. The little influence Echakhch has on the final outcome of her creative process, which entails a four-meter distance between the canvas and the dropping ink , is symptomatic of her multidisciplinary practice—an intricate melange of cultural, historical, sociological and personal observations that are relayed by visual questions rather than affirmations.